This Eastern Cape nature reserve is a place of rolling plains, craggy hills and deep valleys, and has become a haven for the Cape Mountain Zebra. Located some 27km outside Cradock in the Eastern Cape, this park was established in 1937 to save the endangered mountain zebra, which was hunted almost to extinction during the 1800s. 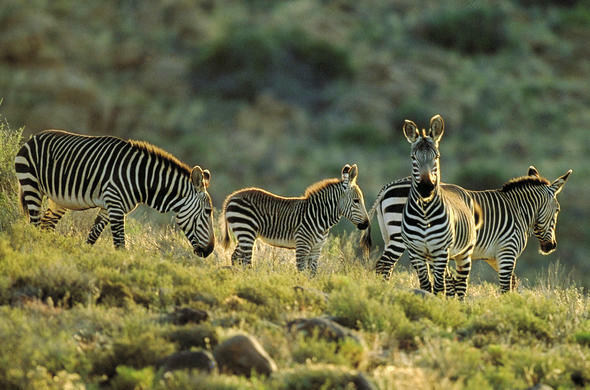 The park is named after the Cape Mountain Zebra. These zebra differ from the plains or Burchell's zebra, by having narrower stripes, absence of shadow stripes and orange facial colouration.The terrain comprises rocky outcrops, mountain plateaus and extensive grasslands and good sightings of mountain zebra are virtually guaranteed, their numbers having increased dramatically since the bad old days of unrestrained hunting.There are several species of antelope in the park including eland, kudu, black wildebeest and springbok and game viewing is made easy by some 40km of good gravel roads, the Rooiplaat plateau providing a splendid vista over the park. Other noticeable species of the mountain plateau are the red hartebeest, eland and springbok. In the more wooded valleys visitors should search for kudu, and two of the park's more recent reintroductions, the African buffalo and the black rhino.There are numerous short walks available for the more energetic. There was a multi-day hiking trail but it has been discontinued since the introduction of buffalo into the park. It may be reopened if the buffalo prove to be particularly mellow specimens but it's not really likely.The camp has a particularly pleasant setting in a grove of trees and consists of a caravan and camping site, 20 fully equipped chalets, a shop stocking basic provisions, a restaurant and a swimming pool. During the winter months it is not uncommon for light sprinklings of snow to fall, while in summer the temperature can soar to 40°C. on occasion.